Provide comfort for the family of Ruth Turk with a meaningful gesture of sympathy. Ruth E. Turk, 88, of Manistee, died Saturday, Dec. 29, 2018, at Munson Healthcare Manistee Hospital with her family by her side. She was bon on April 15, 1930, in Frankfort, Mich., the daughter of the late Ervin C. and Geneva B. (DeWitt) Jensen. She was a graduate of Manistee High School. Ruth married Ted Turk on May 19, 1956, in Manistee. He preceded her in death on Dec. 31, 1977. Ruth was employed as a driver at Dial-A-Ride in Manistee for 30 years, retiring at the age of 75. She was member of Good Shepherd Lutheran Church. Ruth loved playing bingo, the occasional casino tour and spending time with family. Survivors include four children, Nancy Espvik, Duane (Ann) Turk, Dave (Sandy) Turk and Sue Flater (John Brown), all of Manistee; seven grandchildren, Cindy Turk, Jerry (Donna) Turk, Jaime (Mike) Gramza, Jeff Espvik, Candace Turk, David Turk and Dale Turk; nine great-grandchildren, Danielle, Marissa, Logan, Keegan, Kylie, Kennedy, Caleb, Dyan and Emily; her sister, Bonnie Hilliard, of Manistee; numerous nieces and nephews; and her special daughter-in-law, Rosie Turk. She was also preceded in death by her son, Ken Turk; brother-in-law; Larry Hilliard; and son-in-law, Phil Espvik. Funeral services for Ruth E. Turk will be held at 3 p.m. on Thursday, Jan. 3, 2019, at the Oak Grove Funeral Home & Cremation Center in Manistee with Pastor James Friesner officiating. Burial will be in the spring at Trinity Lutheran Cemetery. The family will receive friends at the funeral home on Thursday from 2 p.m. until time of service. A luncheon will follow the service at the VFW Walsh Post No. 4499. Please visit Ruth's personal page of memories at www.oakgrovefh.com. Arrangements are by the Oak Grove Funeral Home & Cremation Center in Manistee. 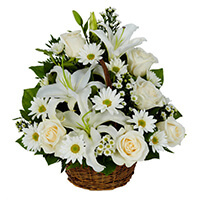 To send flowers in memory of Ruth Edna Turk, please visit our Heartfelt Sympathies Store. Madison Family and Jim & Kathy Stewart have sent flowers to the family of Ruth Edna Turk. Madison Family purchased the THINKING OF YOU BASKET for the family of Ruth Turk. 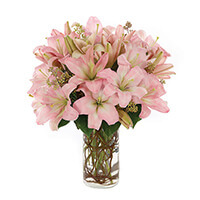 Jim & Kathy Stewart purchased the SIMPLY LILY-PINK for the family of Ruth Turk.